No amount of paragraphing, nothing but a long visit and a close study of the prospects and accomplishments of this giant young community can produce a fair impression of Covina and its extensive fruit industries. Orange groves on every side, reaching for miles in every direction, and running to the very doors of the business houses, is the guerdon of the future of this prosperous section. 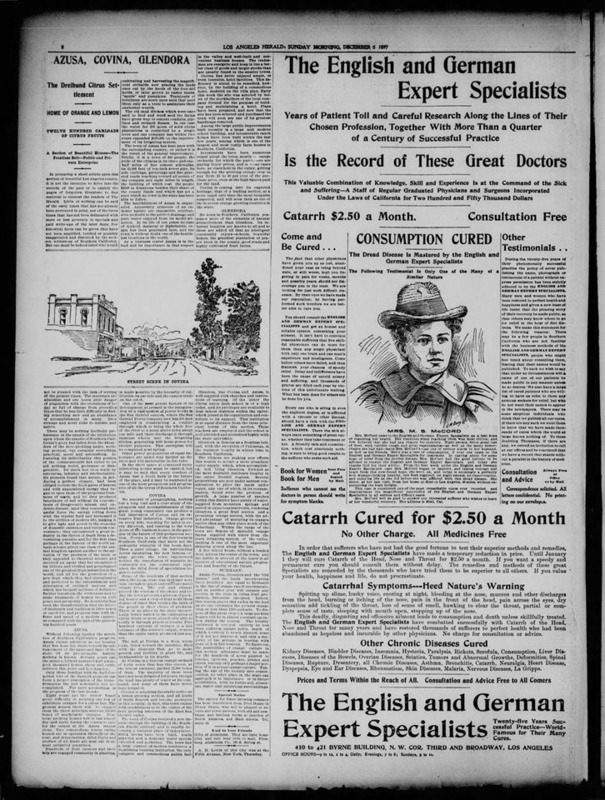 Covina is one of the few towns in Southern California that knew not the unhealthy stimulus of the boom days. Then a quiet village, its surrounding farms incubating the now famous orange groves, the town experienced neither the transfusion of unstable investments nor the consequent lapse when the fitful fever of speculation began to subside. Some of the residents of that section when the boom craze was epidemic were wise enough to plant and cultivate navel orange trees. The soil and climate proved the wisdom of the choice and today the town presents a platoon of packing houses and a crop of fruit to fill them dozens of times that verifies the faith of the people in their choice of products. There is no place in the state theoretically better suited to the cultivation of citrus fruits or more abundantly able to verify it through practical results. Five hundred carloads of oranges is a fair estimate of this season's output, or more than the entire valley produced last season. The soil at Covina is a deep, warm loam, tilted toward the sunshine, filled with the elements that go to make growth and fertility in plant life, and inexhaustible in its depths. At Covina is a famous orange orchard of forty acres that has this season, at the lowest estimate, packed 12,000 boxes of fruit. The majority of these trees have not been irrigated for years, though the land has plenty of water at its command, and some of them have never been irrigated. 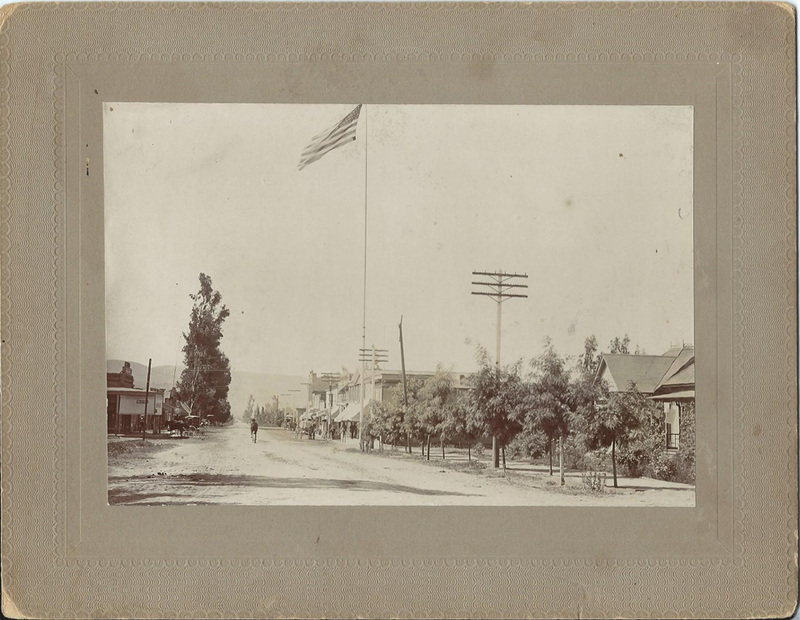 Covina is attaining favorable notice as a lemon growing section, and all kind of fruits flourish and become profitable in this locality; in fact, this town claims with truthfulness to be the center of the fruit growing interests of the East San Gabriel valley. 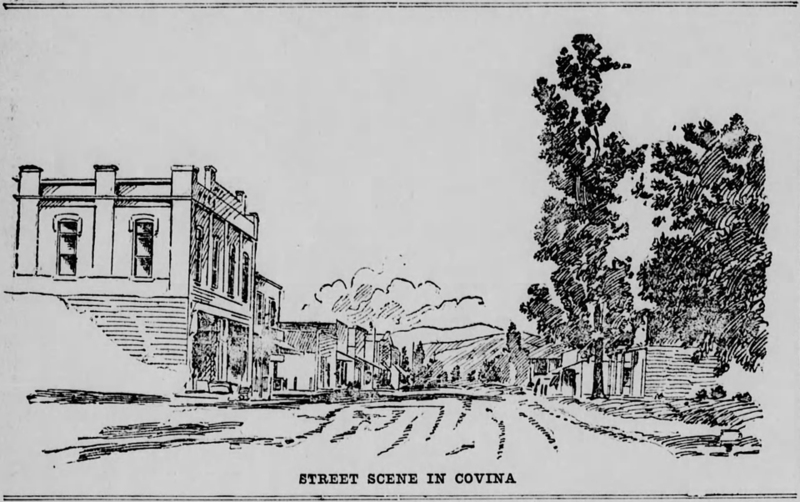 The town of Covina received a new impulse through the building of the Southern Pacific railroad, and is rapidly becoming a business place of importance. Brick blocks have been built, roads graveled and a domestic water system extended and perfected. The town has a large number of modern residences, a flourishing banking institution, the only complete and commodious public hall in the valley and well-built and convenient business houses. The tradesmen are energetic and keep in line a better class of goods and larger stocks than are usually found in the smaller towns. Covina has never enjoyed ample, or even tolerable, hotel facilities. This deficiency is about to be remedied, however, by the building of a commodious hotel, modeled on the villa plan. Early this week the site was selected by ballot of the stockholders of the local company formed for the purpose of building and maintaining a hotel. Plans have been prepared, and now that the site has been selected and purchased the town will soon see one of its greatest handicaps removed. Among the large public improvements built recently is a large and modern school building, and innumerable ranch homes have been built within the last few years, among which is one of the largest and most costly farm houses in Southern California. Investments have been numerous round about the town, mostly in orange orchards, for which the purchasers are paying fancy prices, and in many cases here, as elsewhere in the valley, getting enough for the growing orange crop to pay from 25 to 50 per cent of the purchase price, even at the high figures paid for the land. 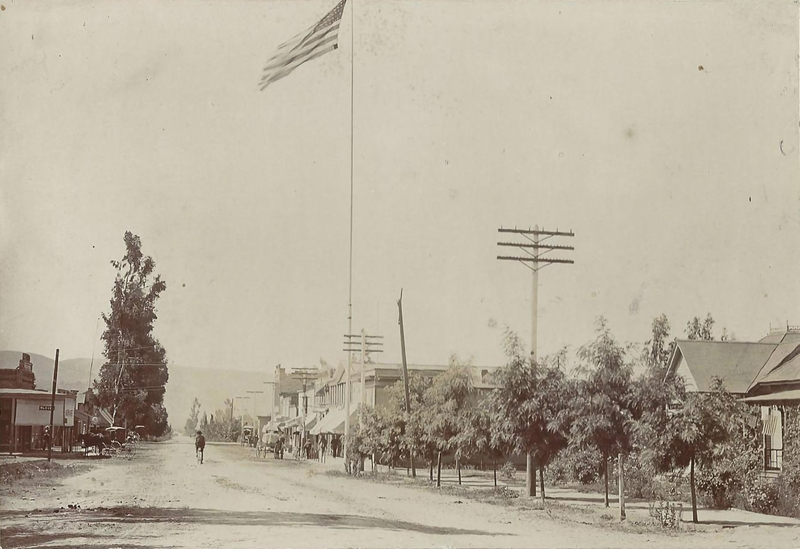 Covina is coming into its expected heritage, that of a leading section, at a more rapid rate than the most sanguine suspected, and will soon rank as one of the heaviest orange growing localities in the state.